1) Festivals, religious rites and rituals from the first day of the month chaitra to the third day (Akshaya Tritia) every evening, puja is performed in the spring season (vasant). During this season, Mahapuja, Arti, Mantra Pushp, eatables given to god at its feet (Prasad) and Dakshina distributed. 2) In the month of Ashwin (the 7th month) from the first day to the full moon day (Tripuri Paurnima) every evening. Mahapuja of Shree Ganesh is performed. On the pillar vertical rows of lamps (Deepmala) is lighted and festival of lights celebrated along with Arti, Mantrapushpa, Prasad and Dakshina Vidhi performed. 3) During Bhadrapad and every other months, on the fourth days (Chaturthi) a palanquin with a silver image of Shree Ganesh is taken around Pradakshina path, by the seashore, and the procession returns to the temple. On its route it stops for a while, in front of the deity on all the four directions, where Arti, Mantrapushpa is performed and Prasad distributed. When the silver image of Shree Ganesh is kept in the central place again the same process is repeated and prayer, for the benevolence of all the devotees, is offered. As shree Ganesh, throughout the year, is in Ganpatipule, no one brings Ganesh idol in one's house separately for puja. As the image of Shree Ganesh is devoid of any form (Nirakar) an hill from where the water trickles is considered as naval point of the idol, that is why it is called Nabhigangodak. There is a perennial flow of sweet water, even though the seawater is very near. This place is to the right outside the temple. When Ganesh idol was under grass roof, the sea water bath used to take place. But as the building was constructed opposite to the site of the idol, the water trickling from the hill on the idol was getting mixed with seawater. During rainy season the sea water bath takes place. 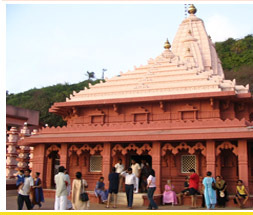 The temple is so constructed that every year during 2nd to 8th February and 2nd to 8th November, at the time of sunset golden rays of the sun falls on Ganesh idol, through the door on the west. This event is very pleasant to watch, due to the vicinity of sea, magnificent and bountiful natural scenery, the vast expanse of the sea water, the rolling and roaring of waves, ships passing at a distance the splendour of the nature makes a man enchanted. The scenic beauty at the time of Sunset makes a man spellbound. The devotee visiting Shree Ganesh temple, returns to his place with the blessings of Shree Ganesh satisfied with heart content, carrying the pleasant remembrance of this sacred place. At the sacred place of Ganpatipule, numbers of persons have led their lives for deep austerity at the feet of Shree Ganesh. Near the house of Kelkar, running charity dining place - ten to twelve such Samadhis, are well maintained in a triangular walled compound. When one comes out of main gate, at a short distance on pradakshina - path, one comes across two pillars on which row of vertical lamps (deepmala) are lighted and a small structure with a dome in which an idol is installed - known as Morya deo. One does not know when this installation took place. But the legend is that, near Ganpatipule, at Malgund, one person Bhandari by cast was plying a passenger ship owned by him, to and fro various ports along the coastline. On one such trip when the ship was entering Tiwari port, cyclone took place and all the passengers experienced a frightful state of mind due to its severity. The place of landing became invisible. The waves became so violent that the ship would not withstand its impact and was about to sunk, thought all the passengers. The owner of the ship requested the passengers to start chanting the prayers along with him and Shri Bapat. Shree Ganesh, as if, heard the prayers, an astonishing event took place, before the passengers came to know as to where the ship was it came safely near the sands in front of the place where Morya deo was installed. All the passengers were full of Joy and thanked Shree Ganesh for averting the calamity. According to the advice of Shri. Bapat the owner of the ship erected two lamp pillars and installed the shrine of Shree Morya deo, and for carrying on the daily rites, donated a piece of land at Malgund. This arrangement continues even today, by the descendents of Shri Bapat.